Even though enthusiasts are not FIC's main target audience, they still usually include quite a bit of tweaks and overclocking options and the AU11 is no different. 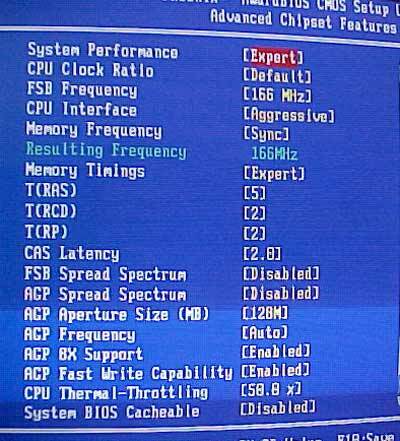 From CAS Latency adjustments to CPU Voltage, FIC gives their users total control of their computers. As you can see, the BIOS is very similar to what we saw with the MSI K7N2. Here in the Advanced Chipset Features we can raise the FSB from 100-200 MHz in 1 MHz increments and 204, 207 and 211 MHz steps above that. We can have the memory run in sync with the FSB which give the best performance or faster then the FSB (which does result in lower performance). There are the usual memory tweaks we expect here, and there are all the AGP options as well. Nothing has been left out. 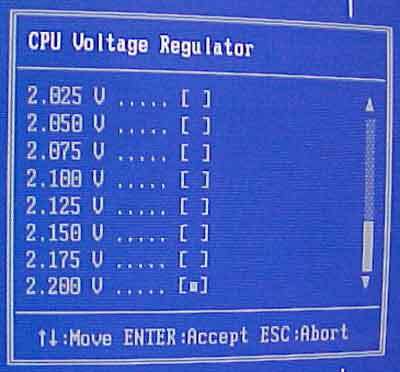 In the Power BIOS Features, CPU voltage can go as high as 2.2V . Very handy to those overclockers who don't want to voltage mod the motherboard. You can also raise the AGP voltage to 1.9V, and the memory voltage up to 2.9V.